Vestiaritai are the finest swordmen the E. Roman Empire can marshall. Drawn out from the most trusted of spathatoi, they become entrusted into the imperial household. In there they are provided with the best armor and weaponry the empire can acquire. Their helmet is the western “kassidion” reinforced with crossing Iron lamellar. They wear a “bambakion” which is a ¾ inch or more thick cotton cloth padded gambeson, an extra “lorikion” chain mail or scale armor hauberk up to their face, and on top of that an “epilorikion” (quilted cloth armor gambeson designed to absorb blunt trauma, like that of a mace). For neck protection they wear a full gorget, sometimes reaching up to the eyes. They are equipped with a heavily reinforced triangular shield, and wield a “paramerion”, a one-edged sword, sligthly curved like a scimitar and worn at the waist. As the finest swordmen of E. Roman Empire, they are not only expected to charge and break through, but also hold the line to the last man. Vestiaritai are an expensive unit to field and maintain and there is a reason for that. 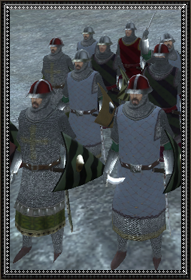 Using the latest advances of western armor techniques and tactics, they are the best swordmen not only in E.Roman Empire, but also on all the surrounding countries. Historically Vestiaritai, were treasury guards of the Treasury of the palace. It was a highly honorary position. Yet the situation of the empire didn’t allow for much ceremonialism or court honours. Vestiaritai along with the Tagmata Excourbiton (or Excourbitores) were the only elite native infantry troops in Konstantinoupolis post Manzikert and the civil wars which ensued and upon them fell the heavy task of fighting the Normans at Dyrrachion at 1081 AD. They were also among the troops to successfully quell the Cuman led Bulgarian rebellion of 1091. Their fighting prowess was never in doubt. To be able to guard the imperial treasury (which included the finest captured armor, which they put to good use) they would have to be trusted by the emperor, as they were. They could outfight most of the heavy infantry units of neighbouring states. Different to the Varangoi in that they were native, if there was one unit in all of the Roman Empire that could be compared to them, it would be Vestiaritai. And being compared to Varangoi, even if inevitably one loses, is no small feat.